Posted on Monday, October 16th, 2017 at 18.45. Assistant Referee’s: Craig Thompson (Birmingham) and Simon Lane (Birmingham). Hereford Football Club, Edgar Street, Hereford, HR4 9JU. Exit the M4 at junction 15 and take the A417 to Gloucester. Then follow the A49 to Ross-on-Wye and onto Hereford. At the roundabout, take the Grayfriars Bridge/Victoria Street road. At Steels Garage, keep left into Edgar Street. Take Blackfriars Street (right) immediately before the football stadium. Turn left for parking. M5 until junction 18a to take the M49. Join the M4 at junction 22 and turn left over the New Severn Bridge. At junction 24 take the A449 and follow until the Raglan roundabout. Take the Monmouth (A49 east) road and follow through first roundabout. At the roundabout, take the A4137. Join the A49 (left) and follow the signs for Hereford. At the second roundabout, take the Grayfriars Bridge/Victoria Street road. Then as South. The Hereford FC Matchday Ticket Office is open between between 6pm-7:45pm for a midweek game. You will need to purchase a ticket here before going to the turnstile. Cash and card payments are accepted at the Matchday Ticket Office. 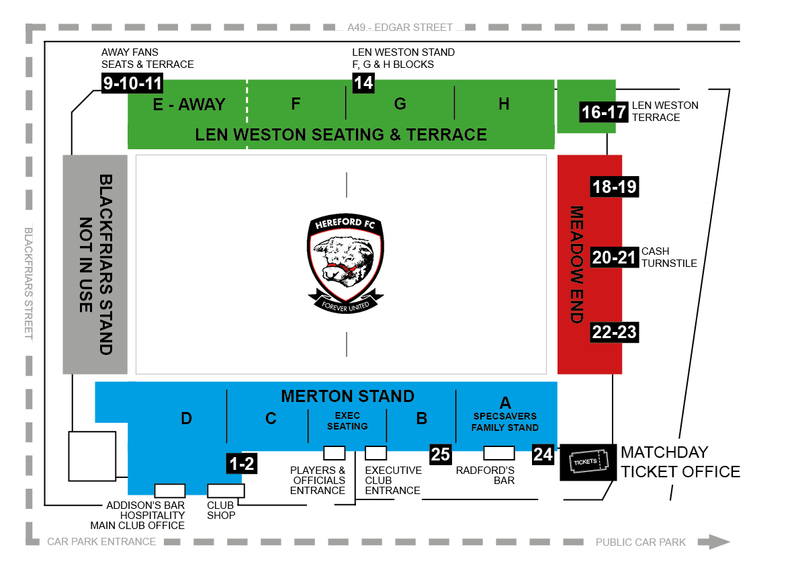 Away supporters are located in E Block (Away) seating. Due to limited capacity in the disabled enclosure, supporters who require wheelchair access are advised to reserve their tickets in advance by phoning 01432 268257. Carers are admitted FOC, but also require a ticket. Radio Hereford FC are providing free Commentary of Tuesday’s game, live from Edgar Street. Tune in from 7:20pm for team news and all the build-up.